Inferno, the film based on Dan Brown’s 2013 novel of the same name, is scheduled to be released on October 28 in the USA. 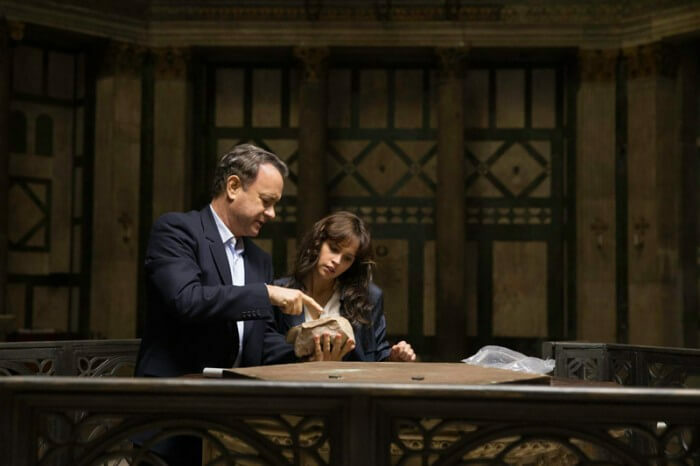 If you are a fan of Brown’s Robert Langdon series, you already know that the latest novel in the series, and subsequently, the film, are set in Florence. A fun and different way to see the city then may be to explore the book and movie locations, which touch on both famous landmarks and less well-known sites of the Tuscan capital. For those not familiar with the story, here is a quick overview of the plot: Harvard symbology professor Robert Langdon (played in the movie by Tom Hanks) follows a trail of clues tied to the great medieval poet Dante. When Langdon wakes up in an Italian hospital with no recollection of what has happened in the last few days, he teams up with Sienna Brooks (Felicity Jones), a doctor he hopes will help him recover his memories. Together, they race across Florence and Europe to foil a deadly global plot. Just as Langdon, start your Florence Inferno tour at Porta Romana, the southernmost gate in the 13th-century walls of the Oltrarno section of Florence, on the left bank of the Arno river. Porta Romana, the main entry point into medieval Florence, is the largest and best preserved gate of the city, and still features the original iron doors and a marble slab with the Medici coat of arms. To escape the Florentine police and Carabinieri officers, who have sealed the bridges and are searching for them, Langdon and Brooks decide to walk across the nearby Boboli Gardens to try to reach the city center. Adorned with fountains, statues, ponds, lovely meadows, canopied wooded paths, and small groves of trees, the Boboli Gardens are located behind the Pitti Palace, the residence of the grand dukes of Tuscany for nearly four centuries. Take some time to stroll through the gardens, which are a fine example of formal 16th-century Italian gardens, before reaching the Grotta del Buontalenti, the eerie grotto built by Bernardo Buontalenti for Francesco I de’ Medici at the end of the 16th century. A masterpiece of Mannerist architecture, this is where the protagonists hide while hiding from a flying drone. 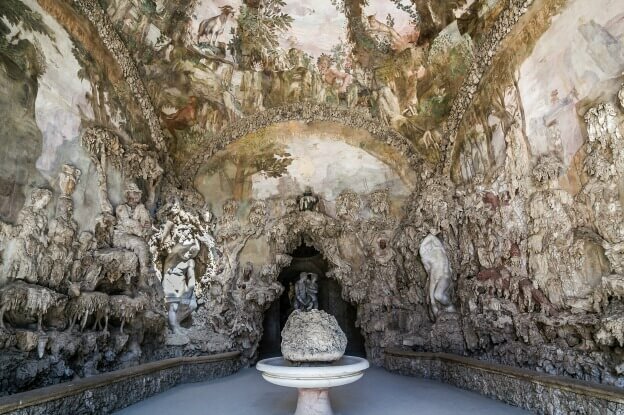 Adorning noble gardens with grottoes was common at the time; the Grotta del Buontalenti has three rooms rich of allegorical elements and symbols. The first chamber houses copies of Michelangelo’s Prisoners sculptures (now housed in the Accademia Gallery). To the left of the Grotta del Buontalenti runs the Vasari Corridor, which Langdon and Brooks take to reach the Palazzo Vecchio while escaping the soldiers who are chasing them. The Vasari Corridor, an elevated enclosed passageway connecting Palazzo Pitti to Palazzo Vecchio, was built to the design of Giorgio Vasari and meant to allow the Medici Grand Dukes to move safely from their private residence at Palazzo Pitti to the seat of government in Palazzo Vecchio. The Corridor houses some 700 works of art, of which 500 are self-portraits, by masters including Raphael, Rembrandt, Titian and Rubens, Gian Lorenzo Bernini, Titian, Antonio Canova. The Vasari Corridor has temporarily reopened after a summer closure, but it appears it will only remain open until November 30 (and you can only walk along it in the opposite direction, that is from Palazzo Vecchio to Pitti Palace). Continue your Florence Inferno tour inside the 14th-century Palazzo Vecchio, Florence’s town hall overlooking Piazza della Signoria. Head to the imposing Salone dei Cinquecento, first built by Simone del Pollaiolo on commission by Girolamo Savonarola who had briefly replaced the Medici as the spiritual leader of the Republic; Savonarola planned to use it as the seat of the Grand Council (Consiglio Maggiore) consisting of 500 members. 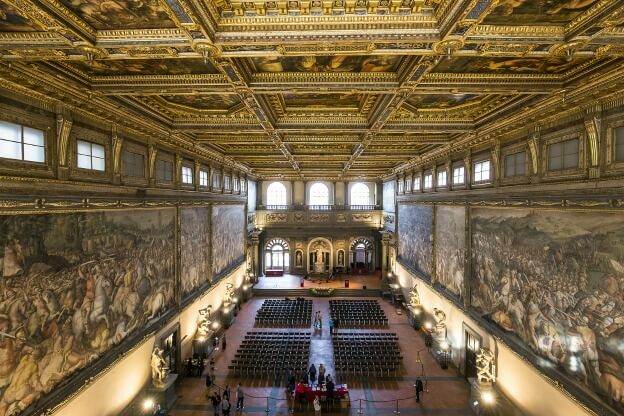 Later, the hall was enlarged by Giorgio Vasari for Grand Duke Cosimo I to hold his court in this chamber. During this transformation, famous but unfinished works of art were lost, including the Battle of Cascina by Michelangelo, and the Battle of Anghiari by Leonardo da Vinci. What is still there though, and of particular interest for this tour, is Vasari’s large fresco The Battle of Marciano, painted in 1565 for Cosimo I de’ Medici. The painting depicts an important battle in the history of the Medici family, fought in 1554, which led to the conquest of the city of Siena. The fresco contains a mysterious inscription, “cerca trova,” (seek and you shall find); Langdon deciphers these two words in the modified Botticelli’s Map of Hell (based on Dante’s own Inferno) he finds in his jacket, leading him to Palazzo Vecchio. In their search for clues, Langdon and Brooks also happen upon the Vasari-designed Studiolo of Francesco I de’ Medici, a small study without windows located at the end of the Salone dei Cinquecento. It is a masterpiece of mannerist style, filled with paintings, stucco and sculptures. Dante and his Inferno play a major symbolic role in the story, so a visit to Dante’s reconstructed house is the necessary next stop on this Inferno-inspired Florence tour. Located on Via S. Margherita, not far from Palazzo Vecchio, Museo Casa di Dante is where Italy’s greatest poet was born in 1265. This house-museum on three floors offers a fascinating glimpse into the life and works of Dante, and it is here that Langdon searches for a copy of The Divine Comedy. Each floor focuses on a different theme, illustrating through panels and exhibits Dante’s private life, his political activity, and exile, while providing information about medieval Florence at the time when Dante was alive. You are now not too far from the world-famous Piazza del Duomo, and close to the end of your Inferno tour, which ends inside the Baptistery, where Dante and many other famous Florentines were baptized. 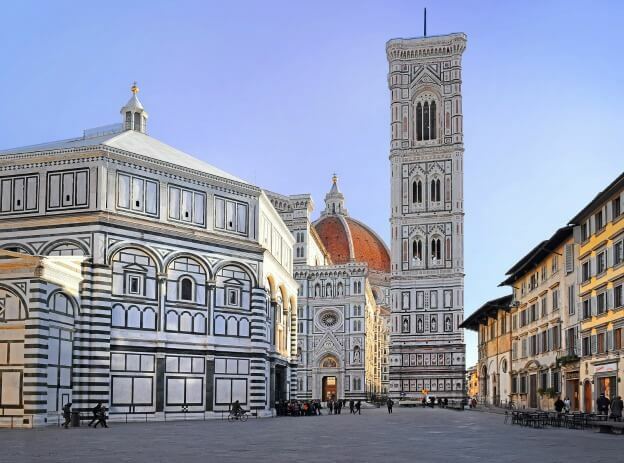 Piazza del Duomo is where you can find some of Florence’s most famous landmarks, including the Cathedral with the Cupola del Brunelleschi, Giotto's Campanile, and, as already mentioned, the Baptistery. Inside it, Langdon and Brooks find Dante’s death mask, which they had been looking for all over Florence, along with a riddle that will take them on even more adventurous pursuits. So perhaps, just like them, continue your adventurous pursuits and don’t be afraid to go off the beaten track in one of the most beautiful cities in the world.